Robert Owen Inc Instrumentation manufacturer - Robert Owen Inc.
A small US business specializing in the manufacture of instrument amplifiers and instrumentation systems. Products and systems designed for simple use. Made in the USA, Shipping Worldwide. Robert Owen manufactures Sensor Signal Conditioning and Sensor Measurement Systems. Specialists in sensor analog & digital signal conditioners. 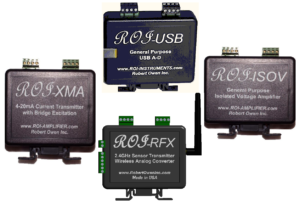 4-20mA sensor transmitters, USB sensor data acquisition, and Wireless remote sensor monitoring are all part of the range of sensor converters we offer. Products include: PLC compatible 4-20mA sensor transmitters, isolation amplifiers, PC compatible USB sensor converters, and wireless (RF) sensor converters. Products for remote sensor telemetry monitoring, & recording. 4-20mA transmitter signal conditioners compatible with Thermistor & RTD temperature sensors, potentiometer level & position sensors, and more. With our ROI-XMA, ROI-ISOV10, ROI-USB, ROI-RFX products; we offer the components that make sensor measurement simple. DIN rail and surface mounted packages. Thermistor, RTD, and Potentiometer measurement are typical solutions for us. Many ranges from our standard products are possible, as well as customized solutions. A number of our standard products can be customized for a special need, let us know your needs.